This is the list of Presidents of Tuscany since 1970. The presidents of the regional administration were, from 1970 to 1999, elected by the regional council. 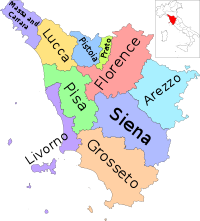 Since the 1999 reform law, the President of the Tuscany Region is an elective office. ^ "Toscana, liberali nella giunta di sinistra". la Repubblica. 1 August 1992. This page was last edited on 19 October 2018, at 10:18 (UTC).